I gotta' hand it to the man - he knows his stuff! Jack always backs up his suggestions with verified science. This not only helps me progress my physique, but my general knowledge too which is incredibly valuable. Jack supports me throughout the process and is a complete star, he has always gone the extra mile to support my progression, and everything we've done has changed my life for the better. Overall my little world is a better place, and that's what matters. Without a doubt, I would recommend Jack to anyone striving to make serious improvements and progress. Jack's attention to detail is a shining factor in his work. When combined with his great communication skills and personal support this adds up to a great package. Jack is great to have in your corner, and I cannot recommend him highly enough. Before working with Jack I never believed in myself, but now I feel completely different. Honestly, I’ve never been so comfortable with a coach before. My mindset has changed, as well as my relationship with food, and now I’m perfectly happy with our approach and counting macros. He's also 100% down for the banter, which makes the relationship so much easier. I was hesitant about whether coaching over the internet would work. But Jack has surpassed my expectations of how good it can be. Jack has taught me how to have a great quality of life whilst still achieving results. Being coached by him has taken my physique to a place I never thought it would reach. Working with Jack really is fantastic and has been one of the best things I’ve ever done! My strength has gone through the roof!! It's such a good feeling. I've noticed a change in my overall body shape, and I'm building in all the areas that I want. Jack is very receptive, aware of the small details and of your personal goals. He does a fantastic job of tailoring structured plans, and truly does his best to deliver exactly what you want. The workout volume and progressions are perfect, he implements a wide variety of sets/reps, and there's time for recovery and structured deloads. It hits that sweet spot where I'm constantly pushing myself, but never feel overtrained or like I'm risking injury. This guy knows how to train. Jack is super empathetic and understanding; never rude or demeaning. He is super smart and you can tell. Work with him and you will see results. When someone is dedicated and love what they do, it translates into their work. Jack is so organised and structured with my plans, and out of all the coaches I've worked with - he is without doubt the best. Jack uses such a wide range of information and studies as the foundation for his coaching, and I'm so happy to work with a coach who is very science based. It's priceless. I can tell working with Jack is going to be one of the best decisions I've made as far as my health and fitness is concerned. I know that as long as we're working together, I am in very good hands. I’ve never put on muscle this fast in my life! And I didn’t really think I'd able to grow my glutes by a noticeable amount, but it's happening. Jack dissects each and every concern I have and answers it directly and clearly, which takes a lot of the guesswork out. I have lots of confidence in what Jack teaches me because he knows his stuff. He knows how to design an exercise plan to reach my specific goals, and everything is calculated very strategically. You know the time spent in the gym is worth it, and you'll get the results your after. Working with Jack has been a far throw from the cookie-cutter-coaching commonly seen on social media. Jack values his client's overall health, wellbeing, relationship with food and general life satisfaction. From day 1 Jack has been relentlessly committed to, invested in and enthusiastic about my personal goals. 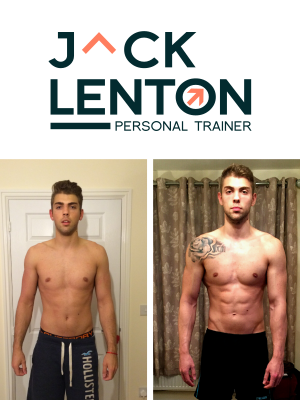 I have seen an enormous change in my physique whilst working with Jack and couldn't have hoped for a better result. If you want your dream body, that perfect physique and you know... to look good naked, then train with this guy. The information and advice Jack gives is well delivered and easy for anyone to understand. He knows exactly what he's talking about and will build a fitness program to suit you. It’s a little scary sending money to someone you’ve never met, but now we’ve worked together for a few months I 100% feel that it’s worth it, and I’m loving my training more than ever. I've gained so much muscle (and knowledge! ), improved my mobility and exercise form, and rebuilt my confidence. Working with Jack is the best decision you’ll ever make with your fitness goals. He always takes the time to answer my questions openly and honestly, and creates plans that I love - the training sessions are amazing! I know Jack 100% supports me and I think that makes a massive difference. I also really enjoy us getting to joke around - it makes the process a whole lot more fun and I think it’s great that Jack builds those kind of relationships with his clients. The support and information I receive from Jack is totally worth the price. Previously I wasn't the most consistent with my eating, however since working together I get better every week. Jack is always there to guide me, keep me on track, and praise me, which makes me feel great and gives me motivation to keep going. Jack understood exactly what I wanted as a client. He has a lot of knowledge, is very motivational, and we worked together well as a team. Every change Jack made always gave me the best result possible, as he tailors each programme according to exactly what you want to achieve. I have built my glutes and hamstrings, and my waist is a lot tighter. I feel awesome and would not recommend anyone else but Jack. Jack is very knowledgeable in his field and builds a real relationship with his clients. He has a quick response rate, and I feel so driven to stay on track. I've been able to stick to my macros everyday so far and that is great!